Many scholars are of the opinion that Makkah Time can provide the world an alternative to the GMT. These people have scientific arguments to back their contention, as Makkah is situated in the center of the world. At a conference in Doha in 2008, Muslim clerics and scholars presented “scientific” arguments that Makkah time is the true global meridian. They said that Makkah is the center of the world. “Putting Makkah time in the face of Greenwich Mean Time, this is the goal,” said Mohammed Al-Arkubi, general manager of Royal Makkah Tower Hotel. The Royal Clock is sitting atop the central tower in the Abraj Al-Bait Project, 50 meters opposite the Grand Mosque in Makkah. The clock will be visible from 17 km away at night and 11 to 12 km away during the day. A German-owned company, Premiere Composite Technologies, has designed the clock. Sources said that the world’s largest clock — six times larger than London’s Big Ben — will be launched in the first week of Ramadan but no date has yet been fixed. The trial run would be conducted on the clock facing Jeddah that is to be inaugurated first. The tower featuring the world’s largest clock also includes a Lunar Observation Center and an Islamic Museum. While the Royal Clock will announce daily prayers, the Lunar Observation Center and Islamic Museum will serve to protect the heritage for future generations. The observatory will also be used to sight the moon during the holy months. On special occasions, 16 bands of vertical lights will shoot some 10 km up into the sky. Custodian of the Two Holy Mosques King Abdullah had ordered the largest clock tower in the world to be built in Makkah. The clock is placed on the fifth tower of the King Abdul Aziz Endowment Project at a height of 380 meters and could be seen from all sides. 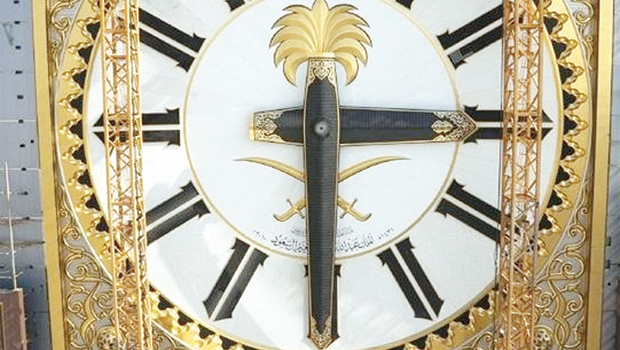 The name of Allah has been inscribed on each of the four clock faces. Two of the clock faces including the inscription will be 80 meters in height and 65 meters in width, and the dial diameter will be 39 meters. The other two clocks will be 65 meters in height and 43 meters in width while their dial diameter will be 25 meters. Two lifts will take visitors to a balcony with a width of five meters below the clocks. The landmark edifice will also carry intricate Islamic decorative artwork. The Makkah Clock Tower when completed will be the tallest in the world — taller than the Palace of Culture and Science in Warsaw, the Big Ben in London, Rajabai Clock Tower in Mumbai, and the Allen-Bradley Clock Tower in Milwaukee. The King Abdul Aziz Endowment Project, which overlooks the Holy Mosque and has been chosen as the site of the world’s highest clock, is one of the world’s largest construction projects. The project was rated the largest architectural building in view of the total area, which exceeds 1.4 million square meters. Designed using Islamic architecture, it contains seven adjacent towers, with 6,000 housing units, and has over SR6 billion ($1.6 billion) in investments. With the construction of the clock, Saudi Arabia, specifically the Western Region, will be the site of two world landmarks, including the Jeddah Fountain, which is 261 meters high. The area of flowing water is 4,000 square meters. Three giant pumps are used to pump water at a speed of 320 km per hour and are 261 meters in height. The 577-meter Makkah Clock Royal Tower will be 59 meters taller than the 508-meter tall Taipei 101 tower in Taiwan, but 251 meters shorter than Dubai’s 828-meter tall Burj Khalifa. The Makkah Clock Royal Tower will have a luxurious 76-story hotel which is the focal point of the Abraj Al-Bait complex, part of the King Abdul Aziz Endowment Project. The opening of the hotel will replace Rotana’s newly opened 333-meter tall Rose Rayhaan in Dubai for the world’s title. The $180 million Rose Rayhaan by Rotana on Sheikh Zayed Road was officially opened on Jan. 6 and has been certified by the Guinness Book of World Records as the world’s tallest hotel. The Makkah Clock Tower will be a key destination for visitors from the United Arab Emirates and the Middle East. The $3-billion, seven-tower complex of hotels, called Abraj Al-Bayt Towers, will contain 3,000 rooms and suites, the majority of which will overlook the Grand Mosque, which Muslims face for daily prayers. Analysts say the projects after completion would change the face of the holy city and create better housing, transport and living facilities for the pilgrims.